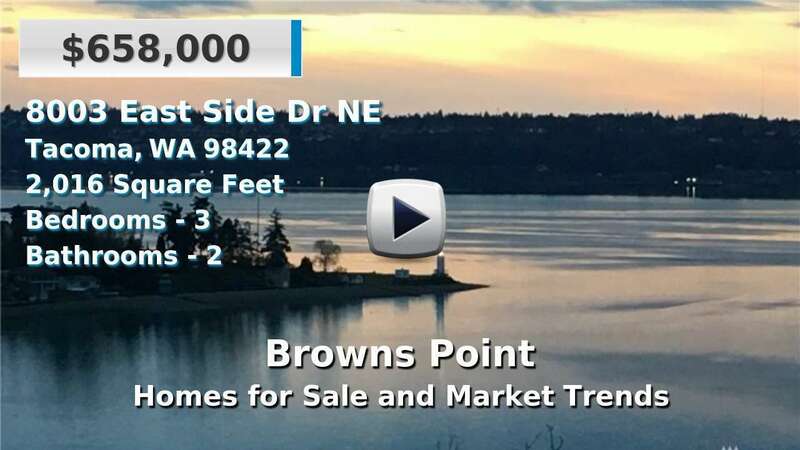 Browns Point is a community in northeast Tacoma on Commencement Bay in the Puget Sound. It is west of the city of Federal Way and adjacent to Dash Point State Park, a 400-acre waterfront park popular with hikers, fishermen, boaters, and campers. The majority of homes for sale in Browns Point were built before the 1960's and have smaller lots typical of suburban Tacoma. 4 Beds | 2 Baths | 1960 sq. Ft.
4 Beds | 4.5 Baths | 5476 sq. Ft.
3 Beds | 1.75 Baths | 2921 sq. Ft.
3 Beds | 2.25 Baths | 2616 sq. Ft.
4 Beds | 3 Baths | 3091 sq. Ft.
5 Beds | 4.5 Baths | 5146 sq. Ft.
4 Beds | 2.5 Baths | 3219 sq. Ft.
3 Beds | 2.5 Baths | 2773 sq. Ft.
5 Beds | 2.5 Baths | 3440 sq. Ft.
Blue Summit Realty has the most accurate and up to date Browns Point real estate listings on the web. Currently there are 17 homes for sale, and 6 vacant land properties in Browns Point. Of the 23 total Browns Point residential listings for sale 0 are bank owned, 0 are short sales, 0 are new construction, and 0 are townhomes. The price ranges from $399,950 to $0 with a median list price of $608,842 and median sold price of $494,089. Make sure to refine your Browns Point real estate search by property type, price, square footage, bedrooms, bathrooms and more with the search tool above or view the Browns Point listings on our interactive map. Our Browns Point real estate listings were updated 4 minutes ago.